The leading grey hair treatment. Pigmentation process using natural ingredients, without dye. 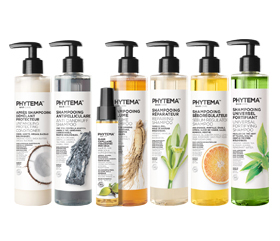 Range of organic shampoos. Free of sulphates, parabens and silicones. For normal, lank, dry, greasy and dandruff-prone hair. Beauty products for face and body. Made in France (Savoie). Eye contour cream, skin brightening serum, anti-wrinkle creams, BB creams, and more. This range of organic brightening care products, specially designed for mixed-race and black skin, has received an Artinov innovation award. What are organic cosmetics? What is special about them? It is possible to care for your skin naturally. We show you how. What causes hair loss? What happens exactly? Why does hair go grey? How to protect hair from harsh conditions? 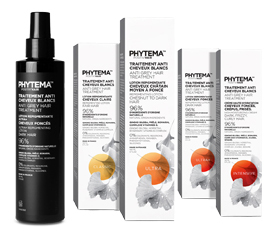 Skin Care™ is the Phytema™ Laboratoires brand for skin care products. All of the products in this range are made with natural and organic ingredients, enabling you to enjoy the benefits of organic beauty products. The Skin Care™ range comprises all of the products that you need on a daily basis to keep your skin healthy. This includes an oil for daily cleansing and moisturising of the skin, exfoliants to remove dead skin cells, and a selection of creams to even out and hydrate your skin. In addition, the Skin Care™ range also includes an easy and effective make-up remover oil, and a purifying mousse to allow your skin to breathe, ensuring that it looks fresh and bright. The eye contour cream helps to reduce crow's feet and shadows. Skin Care™ products help to combat premature ageing by hydrating and revitalising the skin, making it more soft and supple. The advantages of Skin Care™ beauty products are twofold, as you benefit from the effectiveness of laboratory-tested products, combined with natural and organic ingredients for a feeling of natural well-being. find out about new product launches and exclusive offers... join now ! Organic cosmetic, what does that mean ?